Fries! Fries! Fries! They’re one of North America’s best-loved side dishes, but restaurant fries are usually off the Paleo menu because they tend to be cooked in PUFA-rich seed oils. But there’s nothing wrong with the crispy, salty starch + fat combination that makes fries so appealing, so a tasty Paleo option is to make them yourself with a non-toxic cooking fat. Even if their fries are cooked in a healthier kind of fat, some people are still wary of them because of the potatoes. A Paleo diet doesn’t have to be low-carb to be healthy (there’s nothing wrong with a moderate amount of safe starches for most people), but many people still feel better without any potatoes, especially if they’re using a Paleo diet to control a metabolic disorder like diabetes. But even potato-avoiders don’t have to give up fries! The butternut squash used in this recipe is much lower in carbohydrates than potatoes, as well as containing several important micronutrients like Vitamins A and C. These fries are perfect as a lower-carb version of the classic Paleo sweet potato fries – a dish that brings a different twist to an old favorite, great for enjoying with friends alongside a Paleo burger like this portobello burger recipe. Since the oil in this recipe is one of the main differences between these fries and their PUFA-soaked cousins, it’s important to choose wisely. I personally love the taste and cook with olive oil, but it’s a little more complicated when using it to fry because of its low smoking point. If you choose olive oil, make sure to keep an eye on your fries during cooking, to make sure they don’t burn. Coconut oil is always easier to work with, but it will add a little coconut taste to the fries – not necessarily a problem, if you want to put a new twist on the recipe. Alternately, you could always do half and half olive oil and coconut oil. There are two ways to cook homemade fries. The first is the always-trusty oven: just roast them until crisp and golden. The second way is to deep-fry them on the stove. I usually recommend the oven-roasting, because it’s safer and it makes less oily fries. SERVES: 4 PREP: 10 min. COOK: 25 min. Cut the butternut squash in two and remove the seeds. Wash the middle and cut away the peel. Then cut the squash in wedges or sticks in your favorite size. 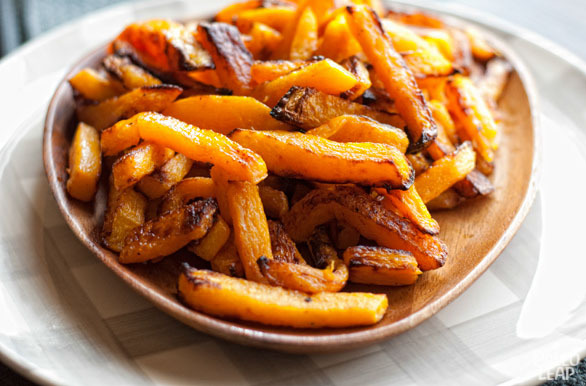 In a bowl, evenly coat the butternut squash fries with the oil and the spices. On a baking plate, place the fries evenly on a single layer. You can place a piece of parchment paper between the cooking plate and the fries if you don’t want them to stick to the plate. Roast for 20 to 25 minutes or until golden and crisp. Season to taste with sea salt and freshly ground black pepper and serve.